The pace has slowed after Saturday’s adventure. Sunday seemed to be a good day to mostly rest and relax. Susan was and is dealing with a bout of sinusitis and Saturday’s five-mile hike to and from Levante did not leave my knee very happy. We did decide to have brunch at The Ginger Loft and, as always, that was very enjoyable. We chatted with Mike and Santi and we got to meet the Carolina of the restaurant Vuelve Carolina. How nice. There is still no new about exactly when our “stuff” will be delivered and yesterday when we went to Patraix to finish the visa process we discovered that all the numbers for the morning had been given out and were told that our best bet was to return Thursday or Friday. Since Thursday is Thanksgiving, that means we will pay a return visit on Friday. Santi had given us a recipe for a possible cocktail to serve on Thursday and we ventured forth to Las Añadas de España to pick up two of the ingredients. It turned out that they had neither. We tried a different Bodega and again no luck. We then decided that our welcoming drink would be something that we used to have in San Francisco at Saul and Sue’s house when we all gathered together the weekend before Thanksgiving. It is a delightful combination of cranberry juice, sparkling wine (Cava here in Spain) and a touch of Triple Sec. The good news is that the only talent one needs to make it is the ability to pour liquid from a bottle. On our way back home we passed by a Middle-Eastern restaurant and we decided to stop in and have a pita. In addition to our sandwich we got a plate of fries and a beverage. The tab was 11 Euros and when we finished we went happily on our way. I briefly dropped by the CIVAC meeting, but was back home a little before 9:00. I spent the next hour or so working on a translation. I have struck a deal with the group that is publishing El Manuscrito in English. I will translate the articles that deal with the magician who is on the cover and will not translate any of the effects. That makes my task all the easier and I do not have to try out any of the tricks I might have translated to make sure they work as advertised. The first issue of El Manuscrito will include a supplement that is a very extensive interview with Juan Tamariz who is Spain’s gift to magic here and abroad. We are off to shop for supplies for Thanksgiving. Tomorrow we pick up the bird. 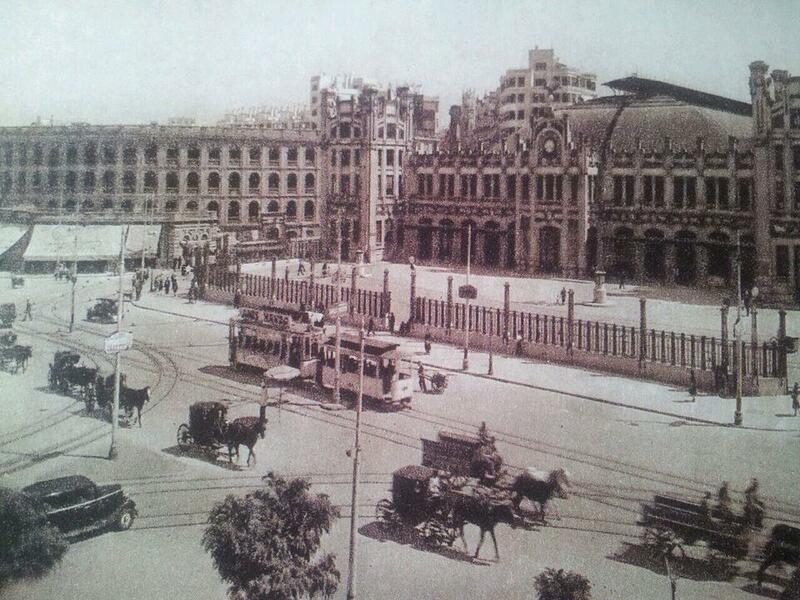 There are no new photos to post, but I am uploading a view of Valencia in 1930’s. You can see the train station and the bullring in the background.